I must have a severe case of Spring Fever! I've lost all track of time (read here)! I had great plans to get outside and photograph the new GREEN leaves that are beginning to burst out from the trees. I thought I had another week...ha! I hope that you will join in and share your GREEN photos. Leave a comment here (and starting over the weekend, you can also leave a comment over at Jennifer Coyne Qudeen's blog) and I'll link to your blog post. Since we're getting a late start this month, I'll continue to update through Sunday, April 19th. Lisa at arzigogolare has photos of her "encounter" with the GREEN rosettes of the cicorino verde. ELFI has some delightful GREENS...from a closeup of a leaf to some crazy chameleon graffiti! Sue and Elizabeth of PGFiber2Art alternate GREEN finds with some of their lovely GREEN screened fabrics. Love that frog! Fran at At the End of the Day, says, "I don't have to search"! GREEN is around her every season of the year! Mary Ann at Blue Sky Dreaming is, "Dreaming in Green", this month! She has a selection of her cloth and mixed media works...love all those different GREENS! Roxanne at Ideas in Cloth is inspired by the GREEN (Greenspiration!) items in her home. Love the pug quilt! Linda at Linda Stokes Textile Artist has some lush Australian GREENS. Sharmon Davidson has some transformative GREENS. Eric at CERULEAN has some leafy GREENS. Margaret at Charlton Stitcher has some English country GREENS. Maya at Take Diversion has some yummy GREENS. Jennifer has finally made it to the party (YAY!)! Back from Jamaica (with a tan, no doubt). Enjoy her eclectic selection of GREENS! Thanks, ELFI. It was so magical! Our collection of greens in on our blog at http://pgfiber2art.blogspot.com/2015/04/green.html. My favorite is the frog! The frog is my favorite too! Beautiful fabrics as well. Thanks for playing! 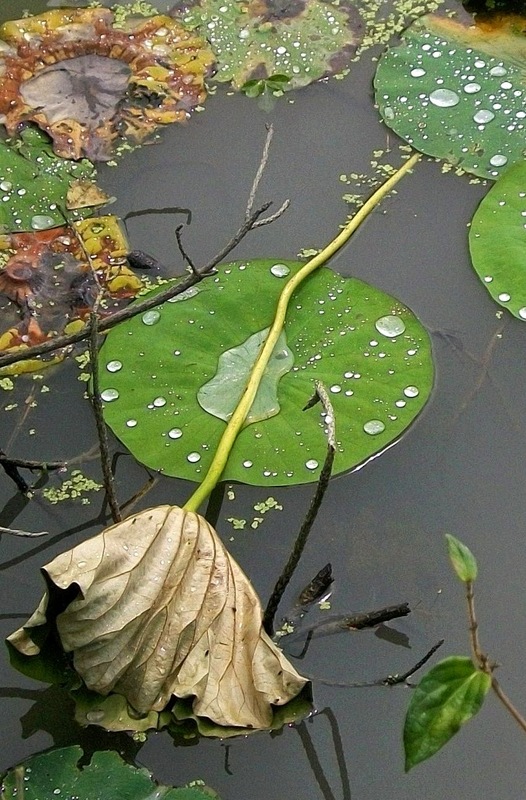 What a beautiful subject...I just love all of your different glimpses of the serene micro-water-world, Julie! Thanks, as always, for your contribution...it's always a treat for me to see what you do each month! Perfect shades of green here...truly perfect for spring! 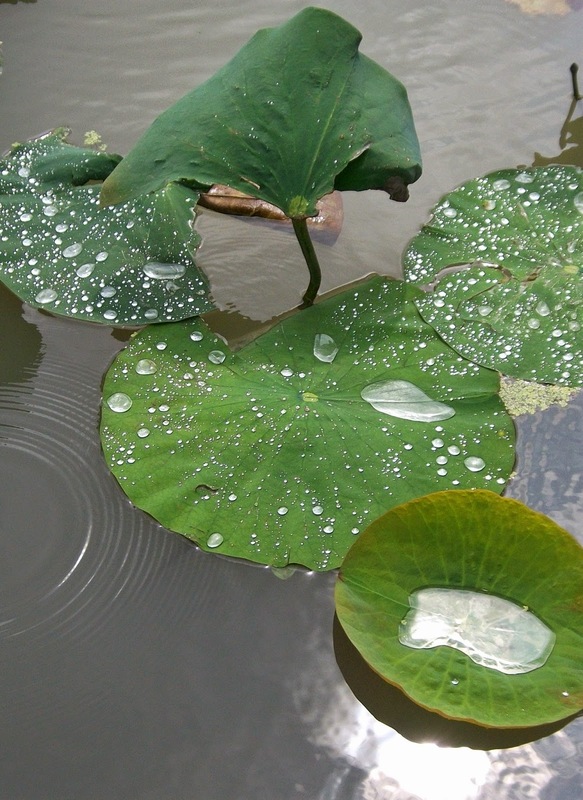 Your lotus photos are gorgeous! I've done my green post too & 1 is lotus leaves. 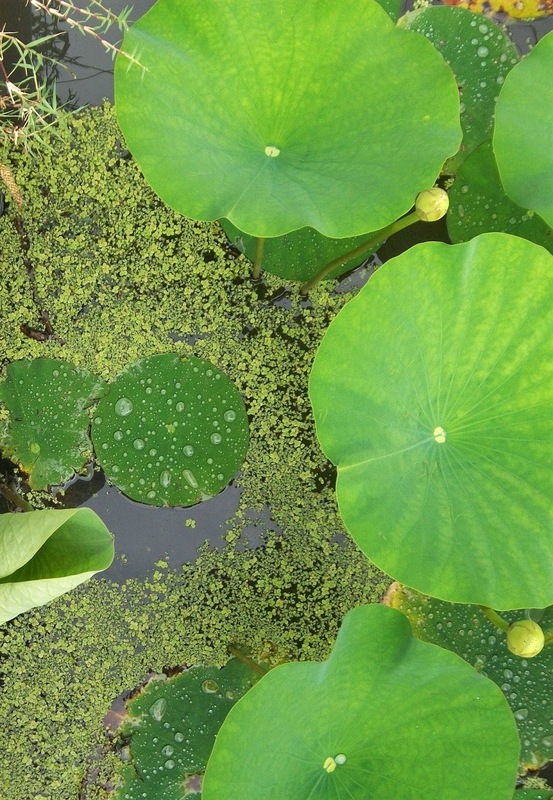 I love the lotus photos - what a luxurious bright/deep green those leaves are! I'm sorry i'm late this time, but I have just posted my greens this morning. Thanks for hosting! Love your photos especially the top one. 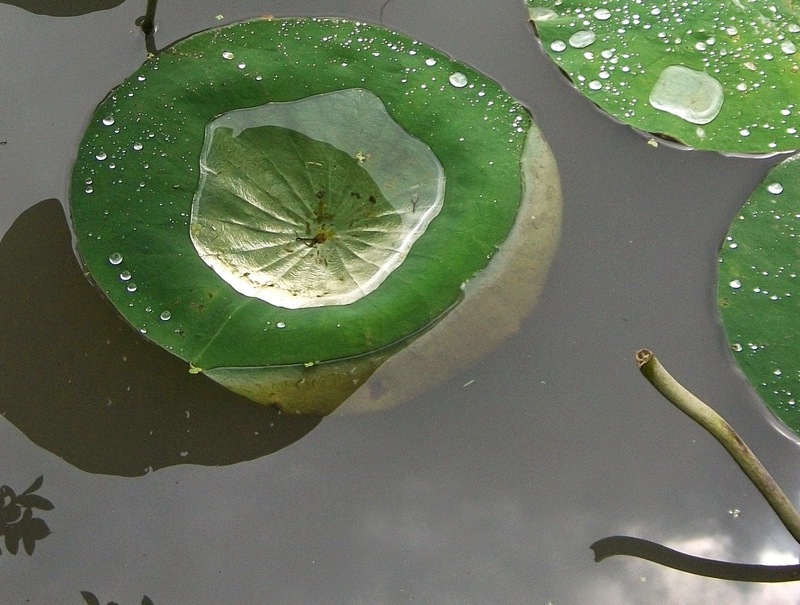 The lotus leaf is always a beautiful treasure in the water. I've just posted my greens, inspired by the Monstera leaf. 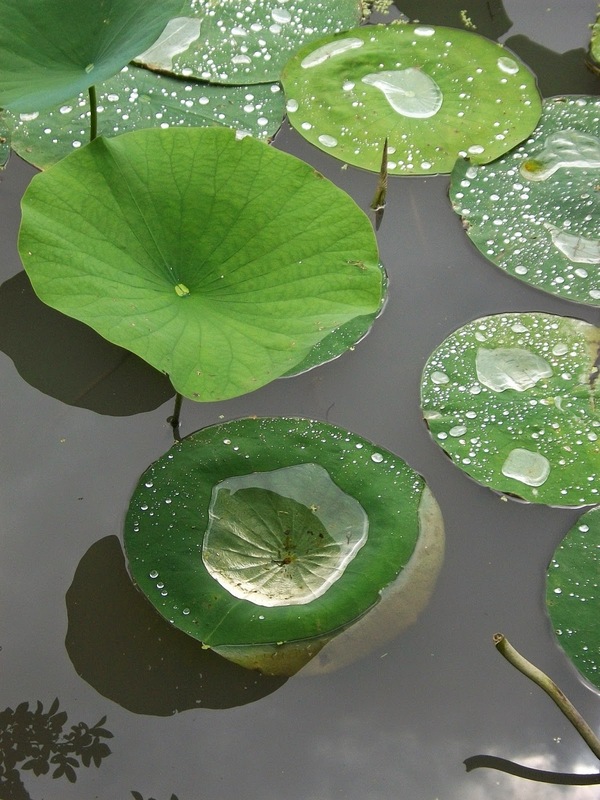 Those lotus leaves, each cupping a little pool of silvery water - lovely! I have just posted over on my blog (belatedly again, I'm afraid) a selection of greens - all to a very home-based theme. Now to enjoy the extraordinary selection that always appears of all the other participating blogs - what a pleasure! Sorry I'm late posting greens for Roy this month. I've just published my post. 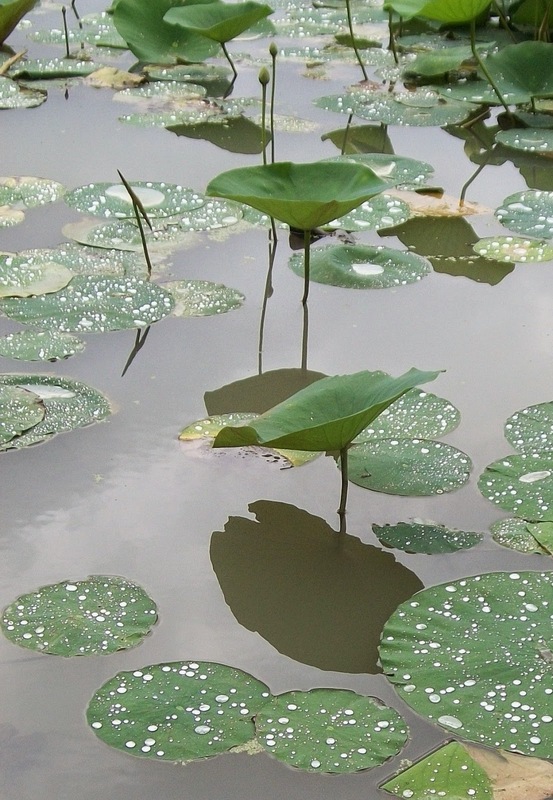 A Lotus pond is so calming and peaceful.